A new Magneti Marelli Automotive Lighting industrial plant for the production of automotive components was inaugurated on 16th May in the city of Foshan, located in the province of Guangdong, in the south of China. The plant, whose construction required an investment of about Euro 30 million, will be initially dedicated to the production of rear lights. Afterwards, it will also produce front headlamps and electronic lighting components. The industrial site covers a total surface area of 26,500 square meters, 17,800 of which dedicated to production. In this first phase, it will manufacture about 2.4 million rearlamps a year, with a total workforce of approximately 300 employees. The products will be mainly intended for the Chinese market and for the international customers located in the south of China. Part of the production will be exported to Japan. The first rear lights to come off the production line will be fitted on models such as Capsa, Fiat, Ford and Nissan. 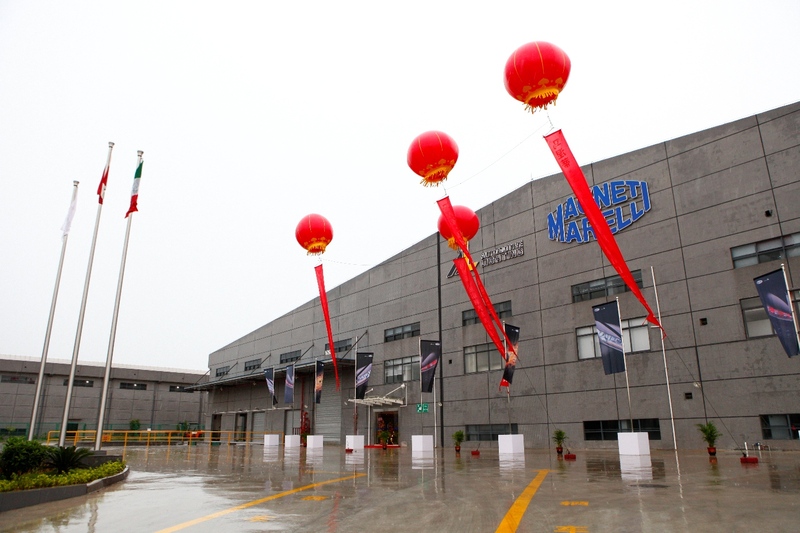 The opening of the Foshan plant is the first tangible confirmation of the objectives illustrated by Magneti Marelli during Auto Shanghai 2013, where just a few weeks ago the Company, on the wake of a growth trend in its own business volume (turnover of Euro 287.4 million in 2012, compared to 240.7 million in 2011) and in the Chinese automotive market in recent years (from 5.2 million vehicles made in 2005 up to 18.2 million in 2012, with an average annual 20% increase: with a forecast of 34 million in 2025 – Source: IHS March 2013), suggested a doubling of turnover values in two/three-year’s time, to then reach the symbolic figure of one billion Euro within four/five years. Specifically, the new Foshan plant will contribute to supporting the plans for growth on the Chinese market of the Magneti Marelli’s Automotive Lighting division, already operating in Wuhu (with about 800 employees) and in Shanghai (Headquarters and Research Centre). The goal is to reach a 10% market share in the medium term, gradually expanding the footprint to all strategic automotive areas in China. Eugenio Razelli, CEO of Magneti Marelli stated: “Magneti Marelli with a consolidated presence since 1996, three joint ventures in the last two years and future plans for a further developed footprint, aims to be a partner of excellence in this huge market capable of helping the Chinese automotive segment and international customers as they deal with and overcome the challenges of technological quality and sustainable mobility”. “The opening of this new plant represents an important milestone for the history and presence of Magneti Marelli Automotive Lighting in China, – said Sylvain Dubois, General Manager Automotive Lighting China – where we plan to grow significantly in the following years. According to this strategy, we aim at providing the best support possible to the carmakers operating in China from a logistical standpoint and at enabling their evolution in crucial technological area, linked with safety, consumption and emission reduction and, last but not least, design”. With an incidence of more than Euro 2 billion in Magneti Marelli’s total turnover of Euro 5.8 billion, approximately 22 million headlamps and 22 million rear lights produced annually, Automotive Lighting represents one of the main areas of Magneti Marelli’s business footprint as well as one of the leading players at the global level in the lighting sector. Automotive Lighting features a global presence, with nineteen facilities throughout the world, R&D centres focused on innovation located in Europe (specifically, in Germany and in Italy) and fifteen application centres operating in thirteen countries in close contact with the customers: Brazil, Czech Republic, China, France, Germany, Italy, Malaysia, Mexico, Poland, Russia, Spain, Turkey and the U.S. Some of Automotive Lighting’s main innovations in the technical evolution of this sector have been the introduction on the market of the first Xenon headlamps in 1991, the Xenon Dynamic Curve Light in 2003, and the first headlamp with active infrared module 2005. Undertaking a veritable revolution in lighting technology, in 2008 Automotive Lighting launched the first full-LED headlamp in the world for mass production (for the Audi R8), with all lighting functions in LED technology. Then came the first headlight worldwide to be equipped with an active infrared night vision system and, since 2010, the first full-LED headlamp with adaptive function (for the Mercedes Benz CLS). The technological evolution resulting from the use of LED technologies and Xenon technologies - with the 35 Watt solution as well as the new highly competitive 25 Watt - has opened up new frontiers in terms of safety, reduced energy consumption and CO2 emissions, at the same time providing new freedom for design engineers. These are crucial issues in terms of the competitiveness of the offer on the Chinese market too, with special reference to the topic of safety and CO2 emissions and, consequently, of sustainable mobility in China. Indeed, according to research conducted by Automotive Lighting, an automobile fitted with Xenon technology for the low/high beam functions and LED technology for all the other front and rear lighting functions can potentially save up to 80 Watt and 2 grams of CO2 emissions per kilometre compared to traditional lighting with halogen lamps. Magneti Marelli has been operating in China since 1996 with production facilities and R&D/Engineering Centres in Shanghai (Powertrain in a JV with Shanghai Automobile Gear Works - SAGW – and Exhaust Systems), Wuhu (Automotive Lighting and Powertrain), Guangzhou (Electronic Systems), Hangzhou (Shock Absorbers in a JV with Wanxiang Qianchao Company), Changsha (exhausts systems with Fiat/GAC), Changchun (Powertrain in a JV with FUDI) and in Hefei (exhaust systems with JAC and Lingdatang).